Health and Family Welfare Department Employee's House Building co-operative Society Ltd has announced their layout on IVC Road- Devanahalli, Bangalore. It is 30 Kilometers from Vidhansoudha. The proposed layout is situated on upcoming 300 feet Road. The Layout is 5 Km distance from Yelahanka-Doddaballapur Highway. The layout is Very near to Orchid Nirvana Villa layout & 8 km from Sobha Life style Villa. The proposed 10000 acres ITIR SEZ HUB is very near to Layout. Cabinet sanctioned 1000Cr Financial HUB is 10 min drive from layout. Asia's largest cargo has proposed in Devanahalli near to this layout. 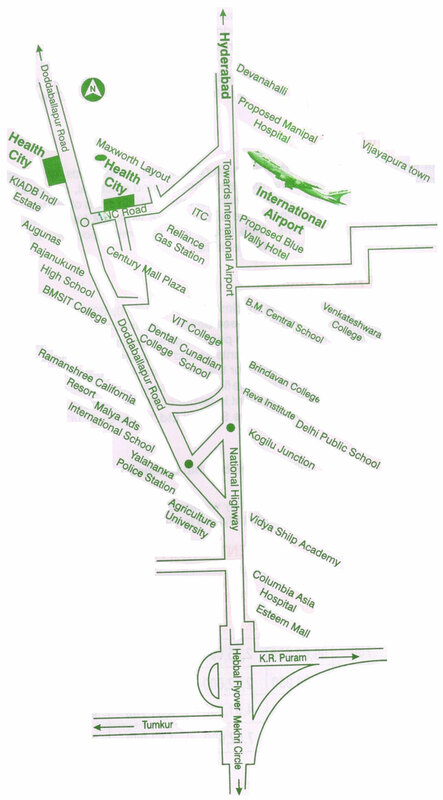 The layout is 10min drive from Airport entrance. Payment must be made in four instalments in a 30 month time period. The booking of a plot in Health City, IVC Road Phase II will be accepted once 30% of the down payment of total sale value has been made. The remaining balance amount must be paid in 3 (three) equal instalments as and when demanded depending upon the development of the layout. Time required for completion of layout will be about 30 (thirty) months. Allotment of plot will be done on a first-come, first-served basis. Those interested in booking a site in Health City, IVC Road Phase II can make the payment in favour of 'Health and Family Welfare Department Employees House Building Co-operative Society Ltd.' via cheque/DD or pay order payable at Bangalore.